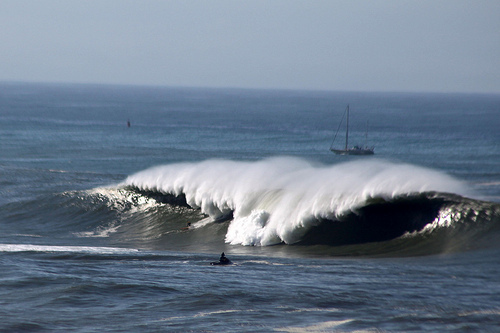 The high surf was the headline this weekend. Also this weekend workers took a well-deserved rest and there’s word that work will begin behind 320 Esplanade and Lands End may receive a permit to begin work soon. There has no news regarding the properties north of Lands End along Palmetto Avenue. The Mavericks Surf competition saw waves over 40 feet tall, but at Esplanade, away from the uniquely ramped sea-floor topology at the break, the waves were a much more manageable 18 to 20 feet. Even combined with high tide, the waves washed harmlessly at the 30+ foot tall rock rip rap revetment at the base of the Esplanade bluffs. They held up well. We have most of the flashing in under the cliff, now, but not the finishing coat. Fortunato expects to begin similar work beneath the apartments of 320 Esplanade in the near future. They’re at the point where the other apartments were when they needed work. According to the KGO-TV 7 (ABC) story No further damage to Pacifica cliffs (2/15/2010) the owners of Lands End are close to receiving a permit from the California Coastal Commission for work beneath their crumbling cliffs, as well. At this point I do not know what would cause any delay, since the Coastal Commission has seemed to turn around emergency permit applications quickly. Note that the text on the KGO-TV web page is current as of February 15th, but the video is old and dates back to January 25th. For a complete chronology and links to many more photos see Evacuation underway at 330 Esplanade.